"The Travelling Gnome" is a popular prank, originating in Australia in the 1980s. 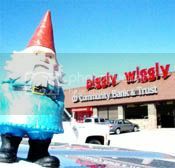 It involves stealing a gnome and taking it on a trip around the world and photographing it in front of famous landmarks (the photos are then sent to the owner). Amélie (Le Fabuleux Destin d'Amélie Poulain), is currently my favorite movie of all time. I've long loved Jean-Pierre Jeunet's previous movies (Alien: Resurrection, The City of Lost Children, and Delicatessen), so going into the movie theater, I was expecting to like Amélie. I didn't expect to go out of the theater in love with this movie. The whole movie, story, music, direction, it was so wonderful (I also suspect it also has a lot of it has to do with Audrey Tautou incredibly cuteness too). If you haven't seen this movie, wow, where have you been? You must get the DVD (it's cheap) and you must absolutely watch it in French. So anyway, Jeunet discovered Yann Tiersen through one of his production assistant who was driving him around. They were basically listening to Tiersen's accordion and piano music in car. Jeunet went out and bought every Tiersen CD and commissioned him to write the soundtrack for Amélie. The soundtrack features a few pieces from Tiersen's four albums, including L'Absente (2001) which he was already working on. One of the track, "Les Jours Tristes", appears on the soundtrack as an instrumental, but appeared on L'Absente with vocals by Neil Hannon (of The Divine Comedy fame), who co-wrote the song with Tiersen. If you're interested in hearing more Tiersen, check out: Maggie♥Music: La Chute, Summer 78 (Instrumental) | Jesse: Le Train | lovelornloser: Comptine D'un Autre Été_ L'après Mid | Yo-Yo: Les Deux Pianos LLes Deux Pianos | Mikey: La Valse D'Amelie.